I mean seriously, who else would I choose for St. Louis? I basically already wrote his Countdown piece back in December, I just didn’t know it yet. So I’m going to rely heavily on that for today’s entry as I don’t need to simply regurgitate what I said there or what I’ve said on Twitter (and elsewhere) since November. Allen Craig is my player in 2013. That much is clear. The wagon is hitched. Next stop: promised land. I’ve taken him just about everywhere in mocks (missed getting him in just one) so far this winter though it appears I’m driving a relatively full bandwagon. Looking at this ADP data from NFBC provided by Baseball HQ we see that Craig is slotted 53rd overall and while I’ve been taking him higher–I’m actually the 21 that qualifies as Craig’s earliest pick which I did here (Team 10) in a November draft during the Arizona Fall League event by Baseball HQ–usually in the 30s, others have are seeing the upside within The Wrench. Since I did this write up about two months ago and some of you have likely already read it, I made something for you to still get your daily baseball fix on the day we* officially turn the page from football to baseball. *I never closed the book personally, I just had both open. 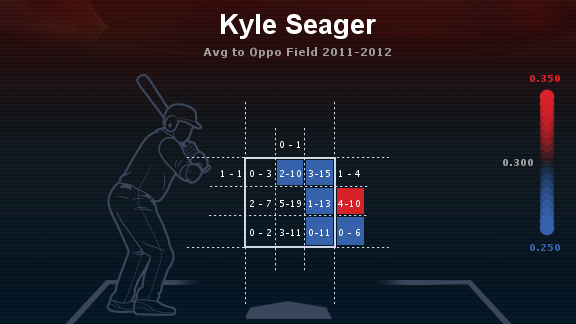 When you look at Kyle Seager’s 2012 line of .259/.316/.423, you jaw will most certainly stay firmly in place. There is nothing particularly special about those rate stats and while they were above average (110 OPS+, 108 wRC+), they don’t lead many to identify Seager as a hot fantasy commodity. Shifting over to his counting stats changes the equation a bit as his 20 home runs, 86 RBIs, and 13 stolen bases were all top 10 at the position (note: he was tied for 10th in home runs with David Freese and Mike Moustakas). All of a sudden he is a bit more appealing. Now imagine if he weren’t stuck in the anti-Coors? Though Seager bats left-handed and southpaws generally fare better at Safeco, he couldn’t wait to leave town. He was an All-Star on the road as his 126 wRC+ outside of Seattle was just a tick behind Adrian Beltre’s 127 and sixth-best among third basemen. He was essentially an American League Chase Headley. Headley finally found a way to do some damage in Petco Park this year en route to an amazing season, but he still led all third basemen with a 154 wRC+ on the road and he has a career 695 home OPS compared to 836 on the road. Ouch, that is rough. He gets 75 percent of his home runs and 70 percent of runs batted in on the road. He does his best to bring something to the table at home by walking twice as often and steal more than three times as often, but that can hardly paper over his incredible home struggles. I’m 89 percent certain that Seager was on site, hard hat in tow, helping the construction crews bring in the fences at Safeco. For those wondering, this isn’t a one-year thing, either. He only had 201 plate appearances in 2011, but 91 of them were in Safeco and they were terrible: .188/.256/.263 with zero home runs. Meanwhile in his 110 on the road he posted a .314/.358/.471 with three home runs. Remember how I mentioned earlier that Safeco Field doesn’t kill lefties on home runs nearly as much as righties? For those who didn’t click, it’s a 91 HR park factor for lefties compared to a 70 for righties. That is borne out in Seager’s numbers as well. All five of his Safeco home runs (which all came in 2012) were pulled. In fact, to right and right center fields Seager is excellent at Safeco over his career with a .339 average, 901 OPS, and those five bombs. His .565 slugging percentage also includes 13 doubles. If he is doing that well to the pull field, can you imagine how bad it is when he goes opposite field? You may want a barf bag nearby. When going to leftfield in Safeco, Seager’s line is an abysmal .195/.191/.248 in 117 plate appearances. He actually improved in 2012. After a 312 OPS–yes OPS, that would be a horrible on-base percentage–in 2011, he jumped all the way up to 482 a season ago. He is being especially obliterated when he tries to “go with the pitch” on the outer third of the zone and just outside the strike zone hitting just .152 (9-for-59) in those instances. Now we ask the obvious next question as we did when discussing Yonder Alonso: how much might the moved in fences help this issue? Thanks to SportsPressNW.com, we can look at a very nice picture of the new dimensions and we see a 10-foot move in the leftfield corner, a big jump of about 12-15 feet in that leftfield power alley, and some minor moves in center and right centerfield. 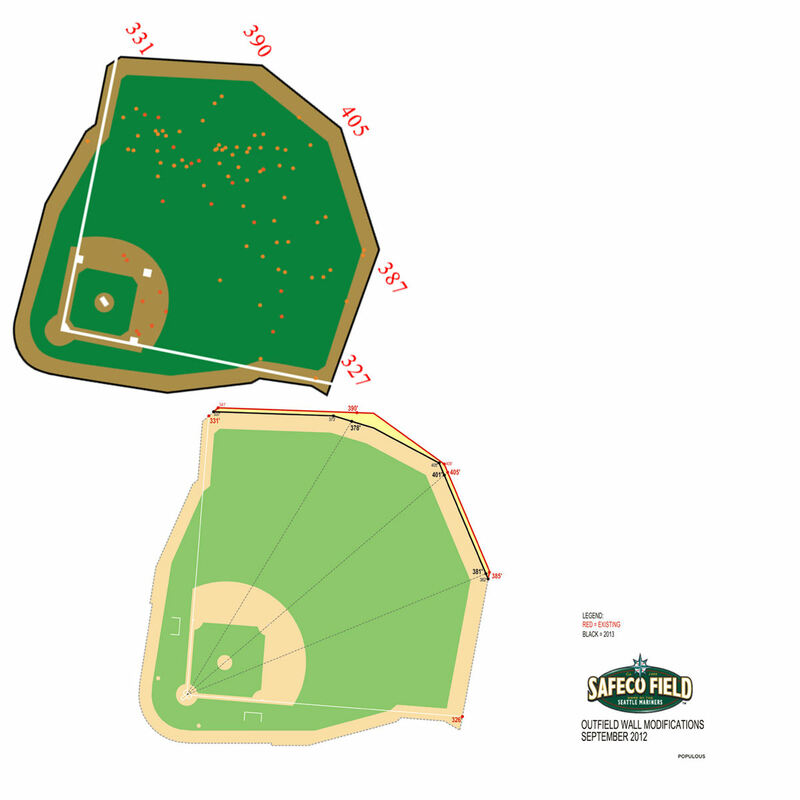 Using the Katron.org spray chart from 2012 for Seager and comparing it against the new Safeco, it doesn’t look like his current batted ball profile is set to gain massively from the move. The dots are his flyouts (lighter orange) and lineouts (darker orange). None of his doubles were anywhere near the edge of the wall so they weren’t included. But as I mentioned with Alonso, this is also assumes he will have the same batted ball distribution again in 2013 and that isn’t happening. 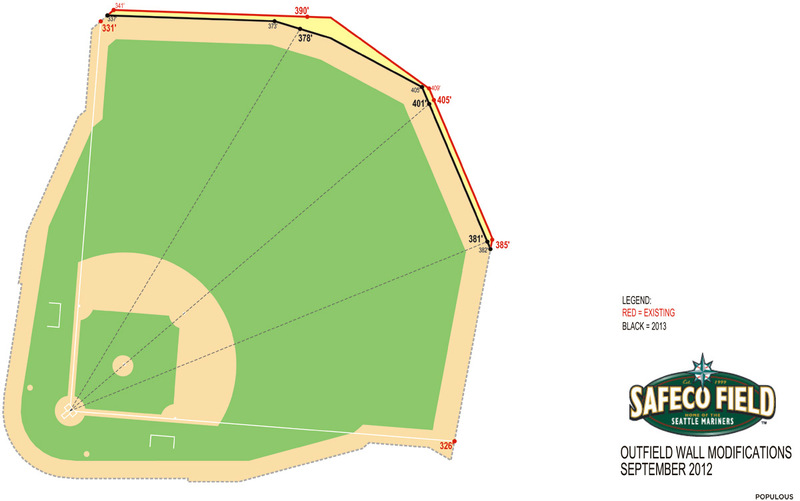 It is worth looking at though because if we saw that Seager was dotting the warning track time and time again to leftfield, we would have reason to be quite optimistic with these moved fences because even if he didn’t have the same exact distribution, he would likely hit at least a few out that way again and they’d be more likely to sail over and into the stands. Seager, like many young left-handed batters, also struggles against lefties. Those problems, as you might guess, are you really exacerbated at home. He has a 646 OPS against lefties as a whole for his career (compared to 766 against righties), but that drops to 545 at home while sitting at a formidable 748 on the road. Another hallmark of youth is struggling with off-speed stuff and that is mostly how lefties handle him at home. None of these samples are big enough to mean a ton, but it’s all we have to work with right now. These thin slices of the data won’t stabilize for some time, but there is no denying from his larger samples that Seager struggles in Safeco, with lefties, and in Safeco with lefties. The moved in fences will likely add more relief via placebo effect than in improved numbers, but Seager is just 25 years old so he still learning. If he focuses on improving against lefties regardless of venue, that will drive his biggest net positive. As long as he continues to steal bases, his fantasy value will remain substantial aided by his 81 road games where he does his best work. Given his age, above average composite work in 2012, and the fact that the M’s just don’t have a viable backup worth sitting Seager for, he should hold the job for the duration of 2013 giving him a chance to tackle those lefty issues. He is currently slotted in the 3-hole of their lineup which is always a good thing, even in a down lineup like Seattle’s. I love Seager as a corner infielder in a mixed league especially if you end up with a superstar 3B early on. His price could be on the rise by the time draft season hits in AL-only leagues as it thins out quickly after the superstars (Beltre, Miguel Cabrera, and Evan Longoria) and moves into the youth bracket with Seager, Moustakas, Brett Lawrie, and Will Middlebrooks.